I'm generally not one for New Year's Resolution. It's not that I find them useless, but I've grown to realize that without some kind of structural plan around it, they are unlikely to succeed or to hold any value in the long run. However, in looking at the year ahead, I do have some goals and things I want to accomplish. I'm not just listing them here but where possible, I give myself some clear means of accomplishing them and what accomplishment looks like. Too often, our goals are too intangible ("become healthy"--health is a continual process; not a singular state) or too vague ("get control of my finances"--what would control look like?). This is doable certainly. At times, I've been close with 8 or 9 (ok, 8.5). I have one of those doorway gyms and can do pull-ups regularly, but get out of habit of doing it. 10 would be a good goal as it will take 1-2 months to get back up to 8 (I'm around 3-4 right now) and if I get to 10, then mayhaps I can set the goal at 15 for the year. Eat out only once a week. Inevitably, when I eat out, I eat more. This includes take-out or eating at restaurants. There's still a nostalgic element to eating out that this is a "special" occasion and therefore I should get the most out of it as I can. This one is also tricky because do I count getting coffee in the morning when I hang out at Daily Harvest Cafe or some other place. I think the goal will be eating out in some form (take out, delivery, dine-in, etc) no more than once a week. However, if I've found myself at an excessive amount of coffee shops that week, then it's cancelled it out. (Maybe like a $20 amount cancels out eating out that week). Anyone that's been reading my running posts are not phased by this at all. Clearly, that's what I've been honing in on. But yes, I would like 2013 to be the year of the marathon for me. I start of the year with a 4 mile run, the Wicked Frosty Four in Salem, MA. If I can hold onto my running routine, I think it will be an achievable goal for sure. So to help me make the marathon level, I think setting this goal would do well for me. It breaks down to just under 20 miles per week which could easily break down to four 5-mile runs or three 7-mile runs per week. It's much more than what I tackled this year, but I think I'm ready for it. Besides, between the marathon and this goal, they will feed into one another and hopefully propel me forward. Having been inspired by the post below on Facebook (I can't find the definitive origin, but this image was taken from Cathie Beck's page. So like the image says, I have a tin (instead of a glass jar) and plan to fill it each day with good things that happen. It's less about enjoying next New Year's Eve and more about making sure I take the time each day to reflect and appreciate making it to the end of another day. 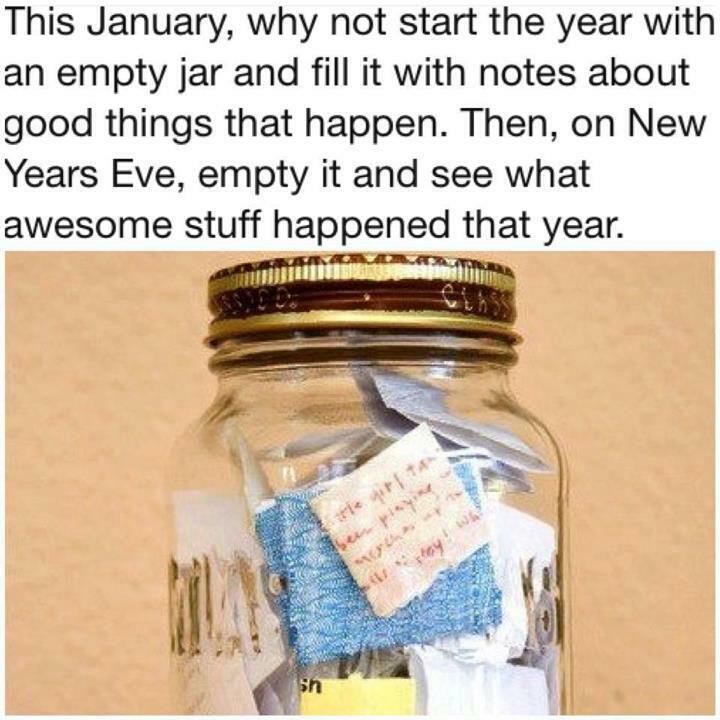 Similar to the above idea but instead of filling the jar with thinks I'm thankful for, I would record a good deed every day. This is one that I'm a little hesitant about because I'm less certain that I do a good deed every day, but I think it's an opportunity to explore such a thing and potentially motivate me to do more good deeds. Of course, the question of what constitutes a good deed I will need to think more about. I talked about this before in a previous blog. In fact, I have started writing the book and have chapters concepts, introduction, and am working on the first chapter. I want this to be the year that I either finish it entirely or get it far enough into it that stopping would be silly. This year, I think I will be dedicating morning time to it before going to work. Typically, that's when I'm blogging or reading, but I think I can look to share that time between blogging and book-writing. I've kept this blog fairly active for the last 9 months. Go me! I've actually seen the resultant bump in traffic as a result and am actually getting regular visitors, which is always nice. I foresee more classes in my future around this. I just feel that professionally and personally, learning programming would be beneficial and of course, I'm generally curious about what can be done with it. I love within 6 miles of both campuses that I work at. I'd like to work on it so that I manage get to work and back several days a week using public transportation, my bicycle, or just my legs. For this year, I'm hoping I can make that number at least three times a week. What goals, resolutions, or ideas do you wish to explore in the New Year? please do! I've already got my thankful note for today!